The Wareham Land Trust, Inc. is pleased to announce it is applying for renewal of accreditation. A public comment period is now open. The Land Trust Accreditation Program recognizes land conservation organizations that meet national quality standards for protecting important natural places and working lands forever. 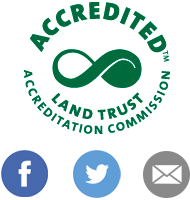 The Land Trust Accreditation Commission, an independent program of the Land Trust Alliance, conducts an extensive review of each applicant’s policies and programs. The process of earning accreditation, in itself, has strengthened the Wareham Land Trust. The policies and procedures used to protect land in perpetuity have been examined, critiqued and updated over the past five years as the organization has prepared to submit its application for renewal of accreditation. Comments may also be faxed or mailed to the Land Trust Accreditation Commission, Attn: Public Comments: (fax) 518-587-3183; (mail) 36 Phila Street, Suite 2, Saratoga Springs, NY 12866. Comments on the Wareham Land Trust’s application will be most useful by December 14, 2018.